I apologise in advance to the excessive level of abstract models used in this post, but there is only so much I can take in the current, mainstream political science discourse in Morocco. I mean, I am a great fan of Wijhat Nadar (the review) and writings of heavyweights like Abdellah Laroui, but it would be fun to explore other alternatives, possibly using teachings from game theory. Plus this is High School-level math, so no harm done. A quick look at a relatively unearthed matter in Moroccan politics can always tell when a consensus crosses party lines, and in this case, it is about the number of seats allocated to each district. Traditionally each and every party vent their respective grievances as to the incumbent districting: smaller parties vehemently oppose high thresholds (PSU found an eloquent advocate against it back in 2007 in one of its prominent leaders, Mohamed Sassi) and larger parties tend to believe their strongholds are undervalued: back then it was USFP in Rabat or Casablanca, nowadays it is PJD in Tangier, Casablanca or Salé. Every election is the same, parties complain to the media, but cannot agree on anything. In fairness, districting is always a zero-sum game, even if the number of seats in parliament is expanded: a large district benefits some type of parties, and harms others. Better still, some parties have contradicting interests on similar constituencies; for instance, the 2011 general elections pitted Istiqlal and USFP (in Fez), PJD and UC (Marrakesh) RNI and Istiqlal (Southern seats) among others. A slight change in the number of seats, or inter-province districting can tip the balance one way or the other. Political parties in Morocco do look (and act) disorganised and utterly incompetent, but this belies their inner rationality as to their political survival. Consider a simple model to capture the perverse effect that compels political parties to defer to a benevolent actor e.g. the Interior Ministry. It is the rational course of action for every political party in Morocco: abdicate the possibility of a contentious (but ultimately more democratic) battle over the optimal number of allocated seats per district, for a more peaceful, consensual redistricting under the auspices of a mechanism-designer with endogenous preferences, ultimately the perpetual weakening of that very same political spectrum. As one can see, the benefit from one additional seat for a particular party stems from the performance of other parties (a primary evidence of the zero-sum aspect of game elections) and most importantly, is negatively linked to this term . In this particular setting, it refers to a ‘premium’ put on the seat(s) won by that particular party. As it shall be proven later, each and every party has a particular incentive at keeping that parameter exogenous – in this case, defer to a higher authority. Because of the higher competition (captured by a competitive districting) between parties mean the overall benefit from seats won by a particular party is diminished, and coming on top is not worth much. and there is your proof: on average, a caucus is better off when the districting is exogenous: this is possible because each district is treated the same; the intuition behind it is, preferential treatment for one district cannot be achieved because every other district will have to be treated similarly, and that takes us back to square one. The best response for each political party is thus to support uniform treatment, and as a result their respective caucuses are weakly better of with an exogenous districting. This is an important result, because individual party interest trumps the collective likelihood of having a strong parliamentary majority (due to competitive districting) and the benevolent designer can only minimise the volatility – if it is indeed in their interest. A candid observer cannot but wonder how Makhzen and Nihilist parties seem to agree on a status-quo that harms representative democracy: true, smaller parties (including PSU) are most likely to be wiped out of the political map if they do not merge or join larger parties, but on the other hand, larger parties also seem to know they are next in line, because the bulk of their seats can be lost if a competitive system were to be introduced, be it an alternative ballot system, or an unfavourable (but impartial) districting. Authorities on the other hand seem to have some incentive in keeping volatility high enough, so as to deny any potentially rebellious party the possibility of commanding an absolute majority, and hence forming an independent-minded government. It seems political rationality in this setting trumps every possible narrative about ideology, or political history. … and ultimately result in a reduction of the number of parties around. November 25th General Elections reversed a trend observed since 1997: smaller parties endorse strong candidates for a winning ballot, depriving larger, mainstream parties from bigger caucuses in parliament, and in the process preventing strong coalitions to emerge. The proportional ballot tends to harm larger parties in specific constituencies when a smaller party (usually a breakaway group) manages to capture some votes and thus deprive the bigger party from gaining more seats on district slots. But during this election, from all 33 competing parties, 18 managed to gain at least one seat, and seven top caucuses concentrate 90.5% of all 305 seats available on local ballot. One of the top seven parties –USFP– concentrates about the same number of seats the remaining 11. Needless to say that this is an improvement from 2007, where the top 7 parties had concentrated only 78% of local ballot seats, while 17 parties (and not 11) shared the remaining 65 seats. By HHI measures, concentration increased from 0.09 to 0.15. In politics, a concentrated parliament delivers stronger -and more accountable- government majority. One of the reasons why so many parties are around is perhaps the lack of internal democracy within political parties, including those belonging to the historical Koutla; The process described by Abdellah Hamoudi is indeed very current: the leadership, more of an aggregate of father-figures, if not outright proponents of gerontocracy, kick out (or are kicked out of) the younger dissent that challenge their leadership, and these in turns create another party that seeks to capture the disgruntled activists. Post-1956 political history is littered with instances: In 1959, Mehdi Benberka, Abderrahim Bouabid and Abdellah Ibrahim decided to breakaway from the more traditional leadership in the person of Allal El Fassi and Mohamed Boucetta, and go on to found UNFP; Mohand Laenser in 1986 kicks out MP’s elder leader Mahjoub Aherdane -who in turn creates his own MNP party.There are very few instances of political parties with proven record in partisan, internal democracy, and this opacity in selecting political elites has worked as a deterrent to prevent a lot of Moroccan citizens to be involved with politics.Many political scientists however see in Feb20 demonstrations a revival of youth politics, and would be inclined to foresee -and I tend to agree with this view- an imminent renewal in our political personnel. One would think that parties lacking both internal democracy and a reliable stock of local notabilities would eventually die away; UC, while being out of office at least since 1992, still hangs on and manages to produce a decent caucus with the 2011 elections. And yet, they look like a smaller version of RNI: both share a common history of ‘Born To Rule’ kind of party, and their faith in all-out free-market ideology is undoubted. What I would like to discuss is a two-steps legislation I believe would change the political landscape in a very short period of time: political finances and multi-party membership. I’d better start with the former. It is very counter-intuitive. How come one individual could be involved with more than one party? And there goes the ‘Moroccan Exception’: Morocco has a multi-party system not out of an inherent and vibrant pro-democracy stance, but because a large number of political organizations weakens that very democracy – and at times, it was even a way for the Makhzen to extend its hold over political legitimacy. But what if we consider some kind of formalized relationship between smaller and larger parties of similar political persuasions; a small party has little chances to go beyond a nationwide 6% of popular vote on general elections; they get a seat, or two, possible 5 at best, but not enough to gain some representation on the national ballot, and that hurts larger parties with whom they share similar constituencies. So a deal can be made to help both parties, especially if they share a common history and ideology: the smaller party can ask to join a large party of their choice during ordinary convention. And given the larger party’s acceptance, an ad hoc common convention at the end of which a common document is produced detailing the quotas devoted to the junior partner(s) in terms of platform contribution, leadership slots and even electoral agreements, e.g. what seats should be the partner’s and at what level. What are the pay-offs for each party then? That’s a contract for sure, and it is best when self-enforced, meaning, that both co-contractors find their benefit in the deal. For junior parties, the benefits are immediate and obvious: niche constituencies at local level with little competition from stronger parties: local community board, perhaps even slots at the regional assemblies (we just have to wait for the Organic Bills that regulate Regional elections) the opportunity to weigh-in nation-wide on policy-making, and finally, better organization and finances. And if the junior party is happy with the alliance, they might want to merge altogether, no problem. Meanwhile, it is their own valuation for a seat in parliament that will condition the essential motive for the whole thing: do they really want to compete so badly, or are they ready to trade an improbable race for parliament for a surer victory at local level? 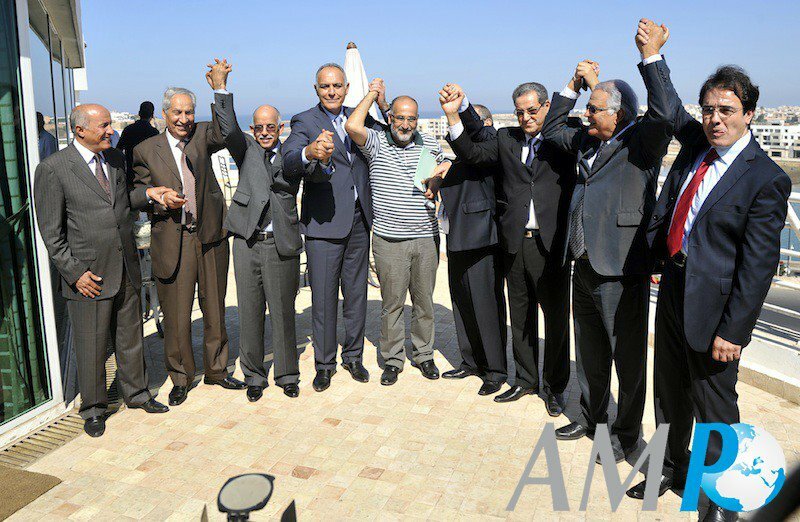 The senior party benefits from the ‘alliance’ during general elections: we consider some seats contested during the November 2011 ballot; In Rabat’s both districts, there were 137 competitors for 7 slots. In Casablanca, the same goes: 34 seats attracted 640 candidates. Tangiers, finally, attracted 110 candidates for 5 slots. Mohand Laenser, the Representative for Boulemane, could have carried his n°2 as well, if the MDS didn’t put a good fight in his constituency: the Haraki vote was therefore split, and Laenser’s majority weakened substantially. Larger constituencies typically tend to attract more candidates from all parties, but ironically enough, tend to harm more larger parties – in a sense, PJD’s victory was more out of their competitors’ weaknesses than some sort of popular mandate. This convoluted argument for a multi party-membership is due to the equally convoluted state of politics, and that goes especially for the Left. The number of political parties with an explicit reference to the Left, Socialism or Progress is now 11 – joined lately, it seems, with the PAM. The same goes for ‘Conservative’ or ‘Rural’ parties. I mean, the sole existence of a dozen of parties -no doubt with such nuanced differences in ideology- only confirms the lack of internal democracy, or a mere issue of egos. The idea is to create some material incentives for smaller parties to come together with larger parties and at the same time spare their leadership some self-pride in the process. The need to make sure politics stays clean of any dirty money is to get public finances to step in. Sadly enough, Morocco has an abysmal record on how the State managed money in the political process. Perhaps a shrewder move is to abolish public-funded schemes altogether. Large parties already enjoy big donations besides regular public money, and smaller organizations will eventually force themselves to put their act together once that lifeline is cut – some will have to merge with other parties, others will just disappear – there is no longer money for the smaller leadership to retain followers. On the other hand, the 100,000 limit is absurd. It really is. La Vie Eco reportedly priced an electoral campaign to 1 Million dirhams. The spending limits on electoral campaign too are ludicrous – especially so when one considers that these limits are not indexed to inflation, these have been imposed by bureaucratic fiat. Perhaps lawmakers were being protective of the right to constitute a political party by giving a ‘fair and equal chance’ and strict regulation. But the fact is, larger parties already enjoy a substantial advantage. Scrapping such legislation will harm no one, it will only recognize the fact that 100,000 dirhams are not enough to run a party. The same goes for limits on polling too, and both activities go hand in hand: it will take a lot of money to order polling, a business now intimately associated with modern politics. So after the released drafts, came the exhaustive manifestos, with their detailed -well, almost- figures on what these parties and coalitions have in store for the Moroccan electorate. There is one sure thing: competing parties are more than eager to announce bombastic figures on spending commitments. It is not necessarily bad politics to play the “caring government” card, but unless the same numbers are buttressed with equally large projections of funding, then all these numbers are built out of thin air. The trouble is, it seems our political parties understood any precise proposals of tax increases could backfire, so they settle for vague pledges to close a loophole or institute a ‘special tax’ with no details of implementation or expected yield. We shall have a look at the following economic manifestos: Alliance A8, PJD and USFP. These are the only ones with decent manifestos at the moment. Alliance for Democracy [pdf] : so far the most profligate competitors with an astounding 130Bn spending increases per annum, for those programs with announced funding, that is. Their pledge to increase Education expenditure up to 30% of Budget spending is a 53Bn joke. It is hard to argue such increase endangers public finances, but the evidence is there: most of the money goes into pay-wage, and still our teachers and professors are badly-paid, and the standards of education are a shambles. I suspect the increase in Education expenditure will take on more bureaucracy, and as they say, throwing money at problems will not solve them. The Alliance also pledges to cut further Corporate taxes to 25% from the present 30%. It means the expected 41Bn receipts will dwindle by some 2 to 3Bn. The mixture in tax cuts and spending increases, accrued to the self-constrained pledge not to go beyond 50% debt to GDP ratio means means they are expecting to solely rely on tax increases to pay for their pledges, and at the same time increase payment to bring the ratio around their pledged target – a 20 Bn increase in debt service alone, not to mention restrain on borrowing requirements. The basic budget accounting shows their net spending increase is more in the region of 100Bn, as far as programs with indicative costing are concerned. To stabilize deficit around 3%, the alliance will have to increase taxes to 80Bn. Spendings’ order of magnitude allows to gainsay the feasibility of their projected budgets, and thus sheds doubt over the supposed image of economic competence A8 leader and outgoing Finance Minister Salaheddine Mezouar is keen to push around. PJD Manifesto [pdf]: PJD has taken a very courageous -but ultimately unrealistic stand on halving unemployment 2 basis points to the region of 7%. This means they pledge to create 240,000 additional job on top of the economy’s regular job creation process. The 3% deficit pledge is a constraint on PJD’s ambitious 77Bn package spending commitments; there are 57Bn in public investments they need to pay for (as part of their pledge to double public investment) they are basically stating the government will take over pension funds and spend around 15 to 24Bn in pensions. A PJD-led government will have to levy 54 to 60Bn in taxes, as per their pledge not to exceed 3& budget deficit, and imposing 30% VAT on “luxury goods” is not going to make up for the required tax receipts. These numbers do not account for other tax cuts they have promised in their manifesto, although it worth noting that any increase in spending needs to be matched with commensurate tax increase, unless PJD considers borrowing money domestically and abroad – a policy I would not trust they would carry out successfully: their manifesto points out domestic debt represents 55% of GDP (p.19 French language manifesto). Well, they have inflated (intentionally?) the number because it is actually total debt to GDP ratio; domestic ratio more around 38% (Bank Al Maghrib’s honour). They have fiddled figures so grossly, I really doubt they have what it takes to manage an economy. USFP Manifesto [doc]: they have adopted what could well be the best course for a party looking on its sunset, i.e. no figures, or if there were any of those, they would not be enough to make a decent policy out of it. All interesting pledges, but as far as precise policy objectives go, these commitments hold no credibility, especially when the same party failed to implement these policies when Fathallah Oualalou was Finances Minister from 1997 to 2007. Ten years to end the amnesty on Agricultural taxes, a decade to levy the wealth tax, plenty of time to reform fiscal receipts. Unless Istiqlal chips in with similar spending pledges, the main political parties and coalitions are not producing realistic costing of their economic programs for the next 5 years. And it is also worth point out no one took the trouble to address the debt issue. Whatever coalition gets into office, they will certainly have to cancel most of their spending pledges and focus on debt reduction ,not because they want to, but because IMF will ask them to do so. Pressure them, really. It is both relieving and saddening to find the ultimate evidence that every single member of the political establishment, elected or not, partisan or administrative, have failed in terms of economic competence. Those in office are being economical with the truth, those in opposition fuelling desperate hope for change, and those really in charge for failing to be fiscally responsible. A net increase in government budget by 100Bn – where will they get the money? USFP manifesto is a compilation of policies with no quantitative targets and source of funding. The 3% Deficit constraints means PJD will have to raise taxes more than what they have promised. 8 political parties have just announced some sort of electoral alliance for November 25th. Note:for the record, the inflationary number of political parties in Morocco compels me to delineate exactly each party’s name. Is this motley of political parties likely to win an election? The law of electoral mathematics in Morocco knows no Euclidean constraints: in 1977 and 1984, respectively Independent and UC candidates wiped the electoral floor with older and much more organized parties. The parallel is not very accurate, but the Koutla, save perhaps for their respective pre-independence history, cannot claim to be anywhere more homogeneous than this Alliance. Plus it displays clear lines between Senior/Junior partners: Assuming this alliance retains a similar number of seats, it is a safe bet to assume it will hold itself together all the way up to 2016. What about the other parties? USFP and Istiqlal will feel genuinely threatened by the PAM-UC-RNI-MP core alliance, and will try to seal a deal by reactivating and strengthening the old-times Koutla, perhaps by including Khyari’s FFD, or even seriously reconsider their position with PJD. The latter is even more threatened by any electoral bloc that would, in effect, put it in an unconformable minority position. Political leaders, it seems, are beginning to understand a free-for-all isn’t going to work. The leader of a political alliance, on the other hand, has reasonable chances to become the next Head of Government. We shall expect announcements on future electoral alliances very soon.